My friend John Grimes, the cartoonist, recently sent me an article from the Washington Post about Sarah Palin’s endorsement of Donald Trump for President of the United States. The writer of the article suggests that since both Palin and Trump are Reality Television stars, this endorsement furthers the frightening trend of American politics becoming little more than a media circus designed to numb the populous while aggrandizing the stand-ins for the despots. But I think there is something else going on here with Trump and Palin, something much older and deeper than Reality Television, though directly connected to the televisionization of our culture and society, which has made us, more than ever before, the victims of aggressive extroverts who seem to be developmentally arrested somewhere between the ages of four and ten. When I was in Sixth Grade, a decade or two before the introduction of Ritalin and other pharmaceuticals into mainstream-education class management, there were two kids in our class, Charlie and Amy, who were both so impulsive, loud, and disruptive, our well-meaning teacher was nearly powerless to control them. And even when Charlie and Amy were not acting out, we expected them to explode at any moment, so our classroom experience was about surviving Charlie and Amy, not about learning. Sadly, these two were not smart or creative or interesting. On the contrary, they were infantile and abusive—Trump and Palin. When Charlie and Amy’s behavior became seriously dangerous, which it did every few weeks—they often erupted in tandem—they would be removed from the class room for a few days or a week, and renaissance would ensue. Kids rigid with fear would relax, discussions would become sophisticated, and real learning would ensue, along with joy and laughter and emotional growth. And then Charlie and Amy would return and so would the Dark Ages. Alas, adult versions of those two abusive children who wrecked school for many of us are plentiful in our society. I’m sure you have experienced the following: You are at a gathering of intelligent thoughtful people, save for one who is not particularly bright or thoughtful or interesting, but he—it is most often a he—holds forth incessantly about nothing of interest to anyone, interrupts anyone who dares speak for more than a moment, and ruins the gathering—the group powerless to overcome this person’s repulsive neurosis. Why are there so many of these boorish people in America? Christopher Lasch posits in his fascinating books The Culture of Narcissism and The Minimal Self, that the breakdown of the extended family within a larger cohesive social fabric, hastened by the invention of auto-centric suburbia combined with the intrusion of television into every home in America, birthed vast numbers of individuals incapable of forming healthy emotional bonds. And those individuals, he suggests, had children who had children who had children, while all the while the social fabric continued to unravel; and we are now several generations along this new evolutionary path to endemic emotional disconnect. When I taught Creative Writing at a summer school for highly motivated teenagers, I became aware that most of my charges did not know how to have conversations. They could exchange bits of information and make pronouncements, but they didn’t really know how to converse. After lengthy field study, I concluded that my teenagers did not know how to listen, did not know how to ask questions, did not know how to ask follow-up questions, and did not know how to think for a moment before responding to things other people said to them. So we held conversation workshops in which my faculty demonstrated how to ask questions, how to listen to answers without interrupting, how to ask follow-up questions, and how to keep listening. Then we had our students practice writing out responses to the answers they received to their questions, which gave them practice in thinking about what they heard other people say before responding. And then we had them practice these techniques in groups of two and three and four people on a stage in front of an audience, after which people in the audience gave the performers feedback about which parts of the conversations they especially resonated with. And though we worked on many aspects of the writing process during those month-long intensives, nothing we did for our students impacted them as profoundly as learning how to have meaningful conversations. For several years after I ceased teaching, I received letters from former students recounting the huge impacts those conversation workshops had on myriad aspects of their lives. I often think of those workshops when I encounter these emotional black holes who will not allow anyone else to speak. You will notice that such people never ask questions of anyone, for to do so would be to enter into conversation. What, I wonder, do these incessant blabbers fear about other people speaking? Could it be that the television itself is the primary role model these people have when it comes to relating to others? How does a television behave? It talks incessantly about the same things over and over again, never asks questions of those listening, and continues talking if anyone else tries to speak. Why wouldn’t people entrained by watching television for hours and hours every day from early childhood and throughout their formative years, imitate that “person”? Of course they would. I don’t watch television, and it is only through what my friend Max Greenstreet informs me is called social osmosis that I know anything about Reality Television. But I would wager that most Reality Television shows feature people who would benefit greatly from conversation workshops. My friend Mark Russell recently sent me a photograph taken fifty-four years ago at a pullout on the Tioga Road halfway between Yosemite Valley and Tuolumne Meadows—a spectacular shot of the Sierras, the deep blue sky awash in billowy white and gray clouds, Lake Tenaya shining in the distance. 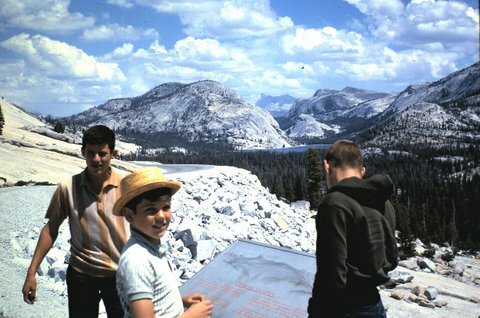 Mark is thirteen in the picture, I am twelve, and we are on our way with our fathers to backpack from Tuolumne Meadows to Cathedral Lake, there to fish for trout and commune with the nature spirits. In this picture, I am a few inches taller than Mark and we are both skinny boys on the cusp of becoming young men. Two years later, Mark and his family moved away and I would not see him again for twelve years. I had gone to New York to meet my first and finest literary agent Dorothy Pittman in-person for the first time, and to lunch with the three magazine editors—Seventeen, Cosmopolitan, Gallery—Dorothy had convinced to buy one or more of my short stories. I was funding my excursion with money earned from landscaping a freeway overpass in Medford, Oregon, and on a whim, I called Mark’s parents in Connecticut, they gave me Mark’s phone number in South Carolina, and I called him to see if I might come for a visit. I had no idea what Mark had been up to since I last saw him, but I remembered him as funny, friendly, extremely creative, and adventurous, and I wanted to see him again. In junior high school, we played baseball and football and basketball together, and he helped me live through the tedious classroom hours by passing me brief little stories he’d written about naughty children doing silly and gross things, and I would nearly bust a gut trying to contain my laughter until class ended. Thus I thought of him as a fellow writer, which was what I aspired to be. A couple weeks later, I detrained in Camden, South Carolina late at night and was met at the station by Mark and his beautiful wife Carrie, Mark sporting a dark brown beard and towering over me. He had married into a family of folks who raised horses, and he and his wife lived with his wife’s sister and mother on two thousand acres of woods and meadows and swamps. Mark had become a maker of fine wood furniture, and I ended up staying with him and his wonderful family for a few glorious weeks in November before I headed back to California. The climax of my visit was attending The Colonial Cup, a famous steeplechase, where I ended up betting on the winner, a spectacular horse named Grand Canyon, and I won a couple hundred dollars. I might have stayed with Mark and his family longer, but my mother called on Thanksgiving and asked me to fly to Palm Springs to take care of my grandparents who were reeling from the suicide of their son, my Uncle Howard. Thereafter, I heard little from Mark for several years, though I did get a letter from him saying he and his wife were now members of a Buddhist community in which the renowned teacher Pema Chödrön was a leading light. When the Canadian government granted permission for Pema and members of her community to immigrate to Nova Scotia, Mark and his wife moved there. I’m not sure if Mark and Carrie had their two daughters before they moved to Canada or shortly thereafter, but two daughters they had, and now Mark is a grandfather. He also has a successful garlic and squash and kale farm called Garlic Mountain, lives in the second home he built since moving to Nova Scotia, raises fine horses with his wife, plays the banjo, and has built a number of spectacular wooden boats. I know these things about Mark from a handful of letters and emails and photographs he has sent me over the years, and when Mark recently sent the picture of us when we were boys becoming men in the California Sierras in 1962, I fell into musing about why he was so important to me and why I have endeavored to stay in touch with him over all these many years despite the great distance between us. Mark liked me and I liked him. He would come over for supper and to spend the night, and we would camp out under the old olive trees behind my parent’s house, build a fire, and talk about life and the myriad unsolvable mysteries. We went on long bicycle rides together, pushing the boundaries of our known worlds. Mark got me started collecting coins: pennies, nickels, and dimes, and I became fascinated with the history of money, which led me to reading about the history of everything else. His parents were always kind to me and honored me for being who I was, and they laughed at the funny stories I told, whereas my own parents were routinely disapproving of me and disappointed I wasn’t more studious and academically ambitious. Mark was an avid Dodgers fan, I a diehard Giants fan, yet our passion for baseball, our interest in the details of the game, was a bond. Mark loved Sandy Koufax, I loved Juan Marichal. But transcendent of everything, I think, was that we found each other interesting and funny and thoughtful, and when one is eleven and twelve and thirteen, such a bond is golden. I haven’t seen Mark in forty years, but I have no doubt should we ever meet in the flesh again, we will have no end of things to talk and laugh about. What most frightens me about the millions of people who want Donald Trump or someone equally fascistic and misogynist and woefully ignorant of international affairs to be President of the United States, and also what frightens me about those who feel Hillary Clinton would be a better choice for President than Bernie Sanders, is that many of these people are not stupid. When I was in my twenties and roaming around the Midwest working as a farm laborer, I spent several days working for a farmer in eastern Kansas who was unquestionably a genius. He had quit high school at fifteen to take over the family farm when his father died, and had managed through hard work and intelligent planning to become a very successful wheat, corn, and alfalfa grower. He was in his early fifties when I met him, his three children grown, graduated from college, and disinterested in being farmers. Thus he, as most of the Midwestern farmers I worked for in the early 1970s before it became common practice there to hire immigrants from Mexico and Central America, was glad to hire me at three dollars an hour plus meals and a barn to sleep in, to do the heavy lifting and drudge work his sons and grandsons might have done prior to the corporatization of agriculture and the demise of family farms. He read the local newspaper but did not read magazines or books, and he was chagrined to admit he found The Bible largely incomprehensible. Yet his ideas about culture and society and economics, born of his phenomenal intelligence and curiosity, were as sophisticated and plausible as anything I had read before, during, and after college. My father was a vitriolic atheist and a psychoanalyst. In his old age, he was certain he had stumbled on the reason why so many people, even seemingly intelligent people, believed in God. He posited that the tendency to believe in God, what he called magical thinking, was genetic: that most people were genetically hardwired to be magical thinkers. Any argument to the contrary infuriated him, so I would remain silent when he began his lecture about Type A People and Type B People, and how all of human history could be explained by understanding that Type A People, those who were not predisposed to believe in God, cleverly manipulated and controlled the much greater number of Type B People who had no choice but to believe in God. In other words, all the religious leaders in the world since the dawn of civilization were atheists who pretended to believe in God in order to control the genetically inferior masses. My father believed it was the genetic mutation for atheism that began civilization, which was a direct consequence of one sector of humanity gaining power over another through this genetic intellectual superiority. Science and history have shown my father’s theory to be nonsense, and modern history, current history, is replete with examples of masses of fanatically religious people being quite uncontrollable by people not predisposed to believe in God. And that, as I said at the outset, is what scares me most about the governors and legislatures of the majority of American states, and the current majority of representatives in the United States Congress, and the millions of people who favor Trump and Bush and Clinton over Bernie Sanders: these people are not stupid, they are insane. Of course, they would say I am insane for thinking egalitarian socialism is a good way to go. They would say I am insane for thinking we ought to take half the military budget every year and spend it on solarizing every viable house in America and building fast electric trains to give hundreds of millions of people exciting and comfortable alternatives to automobiles, and making education free from kindergarten through graduate school. And they would say I am insane for thinking we should have Single Payer Healthcare. Walking to town today, I crossed the coast highway at the only stoplight in Mendocino, and exchanged smiles with a large man hitchhiking south, his backpack lying on its back on the ground. I continued into town, did my errands, and on my way home found the big man still there, waiting for someone to give him a ride. “Where are you headed?” I asked, curious why he didn’t have a sign.